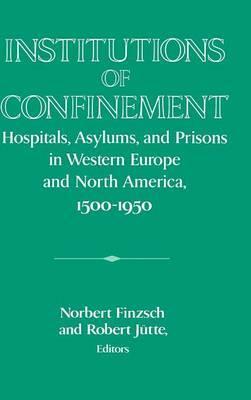 A major interdisciplinary study of the development of prisons, hospitals and insane asylums in America and Europe, this book resulted from discussions between its two editors about their work on the history of hospitals, poor relief, deviance, and crime, and a subsequent conference held in 1992 by the German Historical Institute that attempted to assess the impacts of Foucault and Elias. Seventeen contributors from six different countries with backgrounds in history, sociology and criminology utilize various methodological approaches and reflect the various viewpoints in the theoretical debate over Foucault's work. Preface; Contributors; Introduction: 1. Elias, Foucault, Oestereich: on a historical theory of confinement Norbert Finzsch; 2. Four centuries of prison history: punishment, suffering, the body, and power Pieter Spierenburg; Part I. Hospitals and Asylums: 3. The transformation of the American hospital Morris J. Vogel; 4. The construction of the hospital patient in early modern France Colin Jones; 5. Before the clinic was 'born': methodological perspectives in hospital history Guenter B. Risse; 6. Syphilis and confinement: hospitals in early modern Germany Robert Jutte; 7. Madhouses, children's wards, and clinics: the development of insane asylums in Germany Christina Vanja; 8. Pietist universal reform and care of the sick and the poor: the medical institutions of the Francke Foundations and their social context Renate Wilson; Part II. Prisons: 9. Michel Foucault's impact on the German historiography of criminal justice, social discipline, and medicalization Martin Dinges; 10. The history of ideas and its significance for the prison system Gerlinda Smaus; 11. The prerogratives of confinement in Germany, 1933-45: 'protective custody' and other police strategies Robert Gellately; 12. 'Comparing apples and oranges?' The history of early prisons in Germany and the United States Norbert Finzsch; 13. Reformers United: the American and the German juvenile court, 1882-1923 Karl Tilman Winkler; 14. The medicalization of criminal law reform in imperial Germany Richard F. Wetzell; 15. Prison reform in France and other European countries in the nineteeth century Patricia O'Brien; 16. Surveillance and redemption: the casa di correzione of San Michele a Ripa in Rome Luigi Cajani; 17. 'Policing the bachelor subculture': the demographies of summary misdemeanants, Allegheny County jail, 1892-1923 Lynne M. Adrian and Joan E. Crowley; 18. Beyond confinement? Notes on the history and possible future of solitary confinement in Germany Sebastian Scheerer; Index.